Per a tweet put out by Trevor Pott. This got me thinking as well. The WebGUI has been out for a while, We all know that the new feature functions leverage it in 5.X, yet when I talk to a lot of people in the field, many are still using the C# client, and flipping over to the WebGUI when they have to leverage one of those new functions. 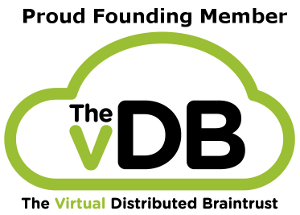 The general understating for all involved is that the C# client is going away, that its going to be all WebGUI moving forward with the next vSphere release. 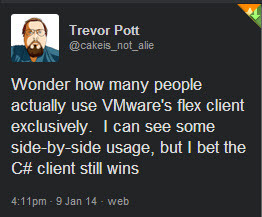 I still think there will be some pushback on that (as well as vSphere Appliance as well). So I’m curious, how are you using it? VMware create product for productivity, not for entertainemnt or social fun. For productivity is bette optimized tool directly connected to API, not slow chain of components, which can be broken. Every components in chain Browser-flash-SSO-Java-API can have problem and can broke chain. I’m the same, I’m 90% C# and 10% web client. But I tell my guys to use and learn the web client for less confusion. I don’t see how they can get rid of the C# Client. You manage your first ESXi host using the C# client until you build your VCENT especially if your VCENT is the appliance or Windows VM. For troubleshooting when VCENT is down and you need to get to ESXi using the C# client. With respect to VMware’s web client 5.5, I do feel that it is much snappier with the 5.5 version so it is not the web client as a product for me. I guess for me, old habits are hard to brake and I get things done much faster on the C# client rather than finding/learning my way on the web client. I’m sure when VMware sets its foot saying no more C# client then I won’t feel bad either way. That’s my take.